Janine is the Jolly Toddlers assistant director and the center’s facilitator of the Pyramid Model/PBIS. Janine graduated from Seton Hall University with a bachelor’s degree in psychology. After college, Janine worked as a human resource manager in her family’s business while raising her two children. 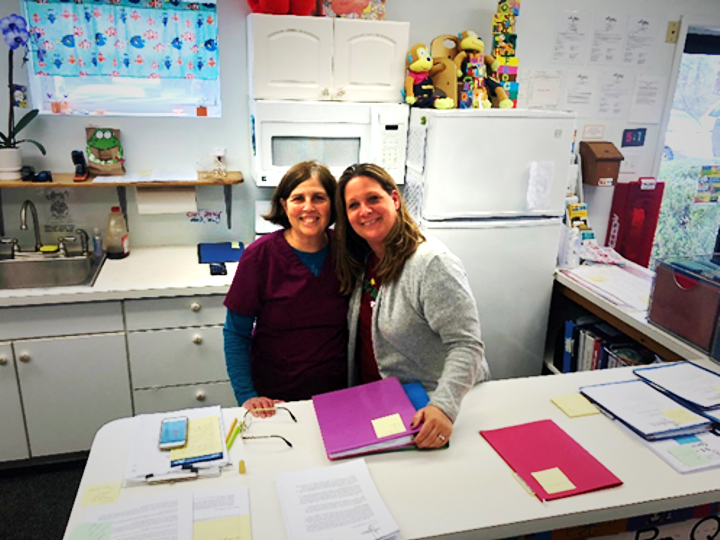 Human interaction and positive reinforcement has always been one of her interests so when Nancy Thompson asked her to help facilitate the Pyramid Model/PBIS pilot program at Jolly Toddlers, she was thrilled. Janine has been at Jolly Toddlers since 2010 and has since received a Child Development Associate (CDA) certificate as well as a director’s diploma in early childhood education. The Pyramid Model, as referred to throughout this post, is a Positive Behavior Intervention and Support (PBIS) framework for young children. It is a tiered intervention model made up of evidenced-based practices. At the base (tier 1), are the universal supports for all children, provided through nurturing and responsive relationships and high-quality environments. The second tier (tier 2) is made up of prevention practices that target social and emotional strategies to prevent problems. The final tier (tier 3) consists of practices related to individualized intensive interventions for children with pervasive challenging behavior that need more than tier 1 and 2 supports and practices. NT: I started my career as a nurse and was a visiting nurse for several years. When I had my own children, I became really interested in early childhood education (ECE). I knew how to physically take care of my children but didn’t know how to promote their learning and development. I decided to take some ECE classes and went back to school. I learned about the importance of the environment you create for young children and supporting social and emotional development. Eventually, I earned a degree in counseling. I thought it was critical to understand what is going on in children’s minds, what motivates children, and the best ways to support their growth and development. Then I decided to start my own business and opened a child care center to meet the needs of local women who were going back to work six weeks after having a baby. I was shocked because I couldn’t imagine, as a working mom, having to find care for a baby that young. I thought that with my background in nursing, education, and counseling I could create a child care center that would meet the needs of babies. We started out serving seven children and now, 33 years later, we have 25 employees and serve 110 kids ages 6 weeks to 6 years old. JF: I graduated with a psychology degree and was thinking of applying to law school but decided to have children and work from home. I did this for many years while my children were young. I’m close friends with Nancy’s daughter and about eight years ago Nancy called me to see if I wanted to volunteer in her center and help her implement Pyramid Model/PBIS. I didn’t know anything about Pyramid Model/PBIS, but with my background in psychology it seemed like a good fit. I started out as a volunteer and loved it. I went back to school, took ECE courses, and earned my director’s diploma in early childhood education. Now, I am committed to our center and to implementing Pyramid Model/PBIS. ED: What is the Pyramid Model/PBIS and why did you decide to implement it? NT: For us, Pyramid Model/PBIS is all about being respectful to one another. You can walk into a center doing Pyramid Model/PBIS and it will take just a few minutes to realize that it feels different. Teachers are respectful to each other and the children, administrators are respectful to teachers, and staff are respectful to families. We actually teach children expectations and rules, and then we teach them strategies for sharing, making friends, and being kind. When I first learned about Pyramid Model/PBIS, I knew I wanted to implement it. There was an opportunity through our local early childhood intermediary unit to pilot Pyramid Model/PBIS. They offered to provide us with the initial training and a coach. We’ve been implementing with fidelity (the degree to which an intervention is delivered as intended) for 6 years. We’ve really seen it transform our center’s climate. There is much more collaboration and there is no gossiping; teachers really help each other out. Across the center we are clear and consistent about expectations of classroom rules and playground rules. We also use visual schedules to facilitate children’s understanding of what their day looks like. JF: Nancy knew what she wanted to do, she just needed a name for it and some support. Pyramid Model/PBIS fits perfectly with her vision. Leadership is critical to implementation, so having her committed has been really important. Implementing Pyramid Model/PBIS isn’t easy; it takes about 3-5 years to get to a place where you are implementing with fidelity. It requires teachers being aware of how they talk to one another and to children. It is a tiered framework for figuring out how to support children in their social and emotional development. When implementing, centers must determine the specific strategies that will work best in their particular center. We have been focused on the bottom tier of creating a safe, warm, and nurturing environment. We have built in a lot of reward systems for the children; our goal is to catch them being good. Staff said they wanted a “reward” system too and soon the teachers started acknowledging one another, thanking each other, and recognizing accomplishments. Pyramid Model/PBIS really opened us up and bridged a gap we had with positive communication and collaboration across staff. ED: How has your work with implementing Pyramid Model/PBIS improved the quality of early learning and development? JF: We are a star 4 program (the highest quality) in our state’s quality rating and improvement system (QRIS), Keystone STARS. Implementing Pyramid Model/PBIS is a big part of why our rating is high. Children attending our center are happy; you don’t hear teachers yelling. The overall climate is wonderful. With Pyramid Model/PBIS, our teachers have been equipped with tools to meet the needs of all the children who attend. Twenty-five percent of our children are children with disabilities—our environment is an inclusive one. Pyramid Model/PBIS gave our teachers confidence to support all of the children, and to meaningfully collaborate with the therapists and special education professionals that come into our classrooms to work with the children with disabilities. Our teachers feel empowered to problem-solve and to figure out what works in an inclusive environment. In addition to the supportive climate we’ve created, our teachers take advantage of the great resources about implementing Pyramid Model/PBIS available online. NT: Helping those with special needs is a priority for us and it has helped our overall quality improve. We regularly monitor children’s progress using the Ages and Stages Questionnaire (ASQ). Families don’t always catch when a child is struggling. We now have the tools to help parents, so if there is a real issue we can help families get the child the services they need. Pyramid Model/PBIS gave us a framework for understanding when a child may need more intensive intervention, and showed us the importance of monitoring children’s progress. ED: What are some of the challenges you’ve encountered with implementing Pyramid Model/PBIS and any strategies you’ve used to overcome them? NT: When change comes to a center there are those that will resist. When we decided to implement Pyramid Model/PBIS, I told our coach that some of our staff may not stay working with the center. In order for this to work, you need to have staff buy-in and for both administrators and staff to truly believe this approach is the right thing to do. I was prepared to potentially lose staff, and we did, but long-term Pyramid Model/PBIS has actually reduced our teacher turnover rate. I believe it’s because the teachers are happy and love to come to work. When we bring on new staff, they are supported by the veteran teachers. For example, if a new teacher starts and doesn’t know how to set up a classroom to maximize positive social, emotional and behavioral development, our veteran teachers will work with them and discuss what works and what doesn’t with a particular age group. JF: Another big issue for us has been when we have a child with significant needs, but that child hasn’t been identified as qualifying for special education. We need extra help to support the child, and this can add a lot of stress for our teachers. At times we have hired extra teachers to provide the support. We know that if this child receives the interventions and attention early, they will thrive, but it can be hard for us as a small business. Our teachers are great at being resourceful and problem-solving; they usually get online and try to find creative approaches. NT: Janine is the internal coach at the center. She works really hard to support our teachers when we have a child with more intensive needs. We are still trying to figure out what this support looks like, particularly when we don’t have access to other professionals to help us problem solve. We are seeing more and more children with behavioral issues, born with drug addiction, and with parents in jail; the kids and parents in these situations are tired, and it takes a lot of energy to help and support them. One solution we’ve found involves working with and educating families. We have shared a lot of Pyramid Model/PBIS resources with our families. When a child is really struggling with behavioral issues, we will collect and share data about the child’s behavior with their family and then develop a plan with strategies that can be used at both home and school. ED: What suggestions do you have for others interested in promoting positive social, emotional, and behavioral development in young children? JF: My advice for a program interested in Pyramid Model/PBIS is to start small, with easy and concrete steps for teachers. Lay it out for them and incorporate their strengths. For example, our teachers were really visually creative and focused on making things pretty, so one of the first things we did was to work on posting rules and expectations visually, including visual schedules that helped kids know what was happening each day. Also, implementing Pyramid Model/PBIS is a process, so be aware that you will likely have to go back and make changes to what you are doing. It really does take 3-5 years, so start small. Some other things we implemented early were bucket-filling books and beginning to teach children to recognize and understand different emotions. These were concrete strategies teachers could begin to use in order to see positive change. NT: Also be flexible as an administrator. You may need to move teachers around. For example, we had to move a teacher to a different age group. You also need to think about how you staff your classrooms. I know that I want a teacher in each classroom that knows those children every day, so we make sure that happens; we staff our classrooms intentionally. We don’t put all of our kids in one big room at the end of the day. It is critical for kids to have their “own” room, and for the teachers in that classroom to really know them. My final suggestion is to be thoughtful about communicating with families on a regular basis. JF: Hold onto your vision but be flexible. Take staff buy-in seriously. This can take time, but once teachers see the positive impact of the new strategies, they become more engaged. Providing structure, establishing clear expectations for kids, redirecting and replacing behavior with something positive—these strategies give teachers the tools to support all children. It is powerful when they use the strategies with a child with challenging behaviors and they see that it works. Our teachers also now recognize the importance of teaching kids social skills. Some children need to be taught how to play, make friends, and behave, and our center now has the tools to do this! Another important thing to remember is that Pyramid Model/PBIS looks different in every classroom and every center. It is an overall feeling of positivity and support among staff, children, families, and administration. It’s building a welcoming atmosphere as opposed to completing a checklist of things you do every day. Effective education faces many challenges: chronic absenteeism, dropout, diversity inequities, antisocial conduct and violence, emotional and behavioral disorders, suspensions and expulsions. We suggest that the solution emphasize the adoption of a two-prong prevention approach that considers informed decision making, selection of evidence-based practices, and implementation of culturally relevant tiered systems of support. The first prong is a long-vision on prevention that requires a systematic and deliberate implementation of daily proactive practices. Prevention is more than “catching kids early.” It is about “vaccinating” all children against the adoption or learning of socially and educationally damaging behaviors. This vaccination requires a daily dose of social skills instruction, practice, and reinforcement on everyday expectations and routines that are imbedded into every instructional and social interaction. At a universal level, we focus on a few school- and classroom-wide traits or values (e.g., respect self, others, and property; or responsibility, respect, and safety) that are defined by specific behavioral examples and linked to typical classroom (e.g., lecture, independent study, transition) and school (e.g., hallways, assemblies, cafeteria, field trips, entering/exiting the school) contexts. Although environmental cues (e.g., posters, signage) are useful, the real impact occurs during each moment-to-moment and day-to-day teaching and social interaction. Development of decision-based data systems that enable efficient universal screening, continuous progress monitoring, and regular checks of implementation fidelity. Use of the smallest combination of most effective intervention strategies that can enhance the most important educational outcomes. Coordination or leadership team that is unwaveringly focused on high fidelity delivery of these practices and systems. Long-vision on prevention includes giving equal priority to the tiered implementation of effective instructional curriculum and targeted differentiated instruction for all learners, especially those with learning-risk (e.g., access to instruction, disability, mental health issues). increases in attendance and academic engagement. The short-vision prong emphasizes implementation of immediate and daily prevention practices, that is, what we do every day, all day, and across all school settings to reduce the likelihood of minor and major behavior incidents and increase the probability of prosocial behavior. Set challenging and achievable academic and behavior goals for every student. Model positive examples of the same social skills and behaviors expected from students. Prompt/cue and recognize desired social behavior at higher rates than are used for negative or norm-violating behavior. Maximize every minute for successful academic and behavioral engagements. Continuously and actively supervise all students across all settings at all times. On an hourly and daily basis, minor behavior incidents (e.g., noises, wandering, off task) should be treated constructively, quickly, and quietly. Incidents of minor disruptive behavior represent teachable moments or opportunities to remind students of the desired behavior and to prompt and reinforce future opportunities to be successful. The process of handling minor problem behaviors should never sacrifice instruction time for any student, and if minor behaviors become chronic, the focus shifts toward a plan that rearranges conditions so that the opportunity to engage in problem behavior is reduced or eliminated. Every major behavior event (e.g., fighting, intentional inappropriate behavior, harassment, disruptive non-compliance) should be treated as a “bad” habit that has worked for the student in the past and is highly likely under specific situations. Because a bad habit by definition is chronic, habituated, and efficient, solutions must be much more informed and targeted. That is, the intervention must be based on a specific understanding of the triggering and maintaining conditions and development of a specialized intervention that formally cues and rewards desired behavior and carefully eliminates competing cues and rewards for problem behavior. This plan must provide at least hourly implementation schedules, especially in the most likely problem behavior settings, by individuals who are better at doing the intervention than the student is at doing the problem behavior. Daily progress monitoring is required to enable immediate tweaking of the intervention to improve effectiveness and efficiency. Effective implementation of this two-prong approach requires more than careful selection and organization of evidence-based practices. Efficient systems must be in place to support staff implementation. These systems include strong school and district leadership that is effectively distributed at the classroom, grade level, department, and school levels. In our most challenged schools, effective principals must be instructional leaders and given at least 3–5 years to establish a durable effective and positive school culture. In addition, principals should share and distribute meaningful leadership authority to important teams (e.g., climate committees, behavior support teams, grade level and department teams) for durable implementation capacity. Daily decision-making must be guided by easily accessible and interpretable data and efficient teaming. Carefully define the behavioral needs of classrooms and school-wide settings. Based on these needs, eliminate practices that are no longer needed or effective and select the best evidence-based practices that have documented good outcomes related to these needs. Establish data systems based on decision rules for progress monitoring and differentiation of supports. Tier 3—intensive and individualized interventions. Contemporary school and classroom challenges must be defined, verified, and discussed. However, emphasis must be shifted quickly from rumination to prevention. A prevention-based multi-tiered system of practices requires moment-to-moment, hour-to-hour, day-to-day, month-to-month, and year-to-year engagement. Practice selection and adoption are necessary but insufficient. Equal, if not more, attention must be directed toward systemic or organizational supports (leadership, decision making, support continuum) that enable implementation to be effective, efficient, durable, and relevant. If implementation fidelity is high and sustained, preventing the development and occurrences of our contemporary challenges is thinkable and doable, and effective classroom and school organizations with common vision, language, and experiences are possible. The preparation of this document was supported in part by the Technical Assistance Center on Positive Behavioral Interventions and Supports and a grant from the Office of Special Education Programs, U.S. Department of Education (H326S980003), Project Officer Renee Bradley. Opinions expressed herein do not necessarily reflect the position of the U.S. Department of Education, and such endorsements should not be inferred. For information about the Center, go to www.pbis.org, or for information related to this manuscript, contact George Sugai at George.sugai@uconn.edu.